It looks like a license plate or a random jumble of letters and numbers put together by a preschooler. But “6EQUJ5” is the most tantalizing lead we have so far towards one day answering one of the most profound questions we can ask: is there intelligent life in the universe beyond Earth? 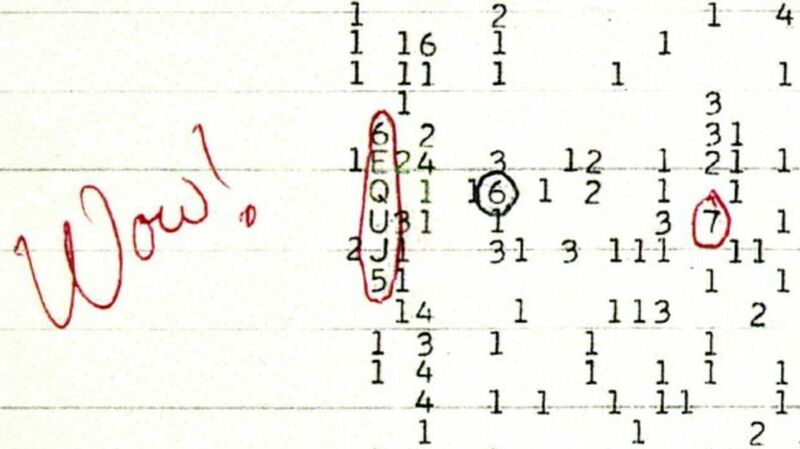 On August 18, 1977, Ohio State professor and astronomer Jerry Ehman was analyzing a stack of recent computer records from The Big Ear, a radio telescope used to search for alien radio signals as part of Ohio State University’s Search for Extraterrestrial Intelligence (SETI) project (not to be confused with the well-known, California-based SETI Institute). Ehman’s task was to look through printouts of what the Big Ear had recorded, searching for any anomalies or peculiarities. Most of the time, it was probably pretty uneventful. But not on August 18. A signal recorded three days earlier, on August 15, jumped out at him. Almost two decades earlier, two physicists from Cornell had theorized that if aliens wanted to contact us, they would use radio signals due to their ability to travel vast distances easily and cheaply. Furthermore, they said, ETs would likely send their message at 1420 megahertz, because hydrogen atoms resonate at that particular rate, and hydrogen is the most common element in the universe. It took 18 years, but eventually, the Big Ear found evidence that gave some credence to that theory. That’s where Ehman comes in. The numbers and letters he checked daily measured the intensity of electromagnetic signals as they hit the receiver. The series he circled indicated an astonishing convergence of events: Not only did the signal occur on the frequency predicted—1420.4556 MHz—it was about 30 times louder than any other normal noise occurring around it. It lasted about 72 seconds, consistent with the rotation of the Earth. Additionally, the signal was a narrowband signal, which requires intelligence to emit: “In order to create a narrowband signal, you have to have some electronics to handle that. It’s not a natural phenomenon,” Ehman explained to NPR. SETI scientists were able to trace the signal back to the constellation Sagittarius, northwest of the globular cluster M55, which contains about 100,000 stars. But there was nothing there that could have made the signal. Puzzled, the scientists investigated other possibilities, including that the signal was a satellite transmission, a military signal, an aircraft signal, a broadcast beam, or even a beam that accidentally bounced off of space debris. None of it checked out, leaving “6EQUJ5” a complete mystery.